Surveyors plunge a pole into the Sierra Nevada to measure the snowpack in this undated file photo. 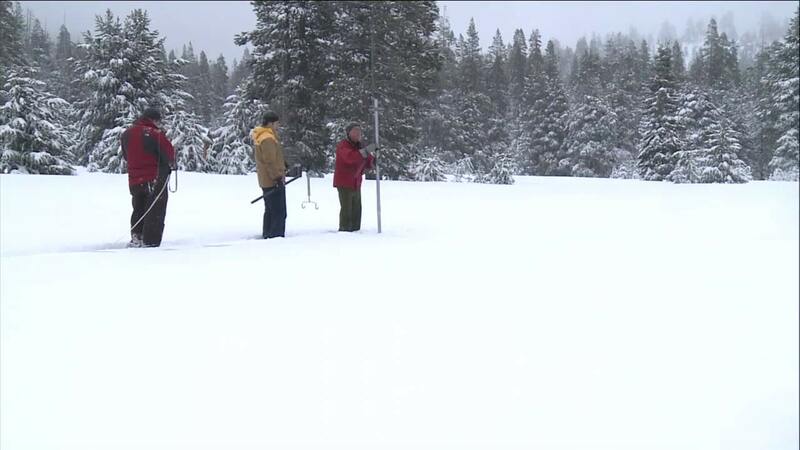 Surveyors plunged a pole into the Sierra Nevada snowpack on Tuesday and took the first measurement of the season, finding the water content was about half of normal as California flirts with a possible sixth year of drought. Surveyors took the reading near Lake Tahoe as major storms were expected to dump four to five feet of snow through Thursday in areas above 4,500 feet in Northern and Central California, while mountain areas below that could get two to three feet, forecasters said. The storms were expected to boost the snowpack, which provides roughly a third of California's water in normal years for drinking, farming and wildlife when it melts in warm, dry months. What surveyors find between now and April 1 will guide state water officials in managing the water supply of the nation's most populous, agriculture-rich state. Electronic monitors at stations throughout the Sierra in late December showed the snowpack's overall water content at just 72 percent of normal despite heavy rain. At Tuesday's reading of the snowpack done by hand at Phillips Station, the snowpack's water content measured at 53 percent of normal, said Frank Gehrke, the state's chief snow surveyor. Despite the lower level, he called it a good start because higher elevations were doing better. Rain was also expected starting Tuesday afternoon throughout the San Francisco Bay Area. The winter storm advisories will go into effect from 4 a.m. Wednesday until 4 a.m. Thursday, he said. "It looks like it's going to be wet all week, and possibly into next week," National Weather Service forecaster Bob Benjamin said. At the height of the drought in 2015, snowpack surveyors stood on a dirt patch for the April 1 measurement at Phillips Station, finding the least snow since records had been taken in 1950. Gov. Jerry Brown responded by ordering residents statewide to use 25 percent less water, letting lawns turn brown - or tearing them out - and flushing toilets less often. The drought eased last year, and so did regulations. The State Water Resources Control Board in February will again consider the conditions, deciding whether the state needs to take a stronger stand on conservation. "If the skies dry up, we'll be looking at something different," board chair Felicia Marcus said. "We're playing this one moment to moment." This wet season started strong. More rain fell in October than in the same month over the past three decades, raising the state's major reservoirs in Northern California and hopes that the drought would soon end. Doug Carlson, a spokesman for the state's Department of Water Resources, said it is too early to predict if the wet weather will end drought. He cautioned that, "It could change immediately and stop snowing and raining." Smith reported from Fresno. Jocelyn Gecker contributed to this report from San Francisco.